Much like the 1400cc inline four engine in the GTR, 2015 was a smooth, fairly uneventful year. There were no breakdowns or niggles with the bike, but there were also no unforgettable highs; the Kawasaki just got on and did whatever was asked of it. It didn’t even bat an eyelid when I ran well past its service interval (sorry about that, Kawasaki). Everything was going swimmingly with the big Kwak until our final weekend together. A colleague had borrowed it for a couple of days, and when it was returned the fuel light was on. Rather than head straight to a petrol station I figured I’d be OK. Wrong. The GTR conked out on a dual carriageway and we wobbled to a stop at the bottom of an exit slip road with only one option; push the 305kg GTR up to the top. If you hadn’t guessed, pushing such a heavy bike uphill in full riding gear is hard work – my kit was still damp with sweat the next day. The GTR has spent its entire time with me living outside, save for the odd night or two in a garage. And, despite my less-than-OCD approach to cleaning, it has held up exceptionally well. A couple of bolts around the rider and pillion pegs were a little fluffy, and a small portion of paint had worn through from my boot on the rear subframe and started to rust, as I mentioned in a previous report. Every morning before work the brake discs had a layer of rust on them, only made worse by a disc lock. But the eight-mile ride to work was enough to rid the disc face of the majority of it each day. The GTR isn’t too awkward to clean, either. There are a few nooks and crannies around the shaft drive and rear of the bike, usually hidden by the panniers, but a bit of patience and a good brush are all that are needed. The vast majority of the bike is the huge fairing, which does an excellent job of keeping wind, snow, rain and hail off the rider, but in turn gets filthy in the winter. When the time comes for our long-term test bikes to be returned there is always one big question: Will you miss it? On the face of it I thought the answer for the GTR would probably be no. Not because it’s a bad bike – it’s perfectly capable at what it does, it just doesn’t inspire me. But, thinking about it a little longer the GTR has enabled me to live my life without a car, thanks in no small part to the cavernous panniers. That luggage, plus a 35-litre rucksack, was more than enough for a week’s worth of shopping. It made long journeys to see friends in Yorkshire, Scotland or London an absolute breeze. The fairing kept the worst of the weather off and made winter riding bearable. It’s a workhorse, but even before the nights became noticeably shorter, it had become nothing more than a form of transport. 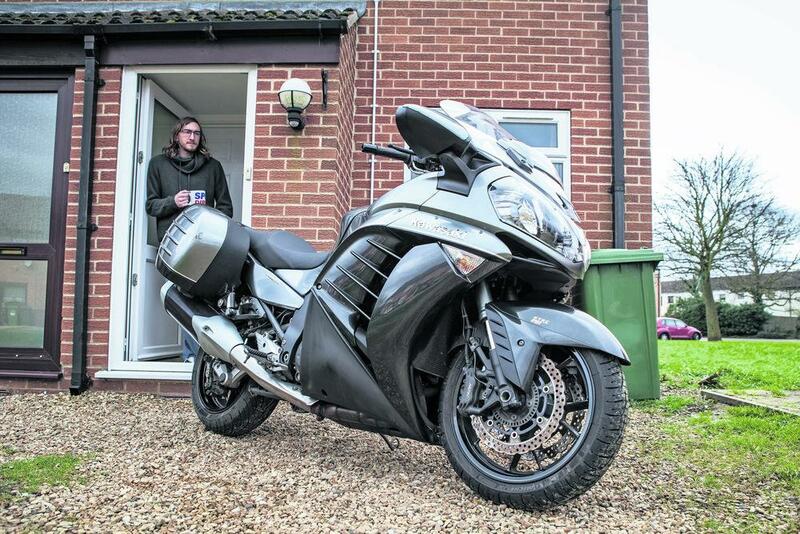 I’ll miss the practicality and ease of use, but – and this might sound harsh – I’m not sure I’ll miss the bike itself.